Brandon Tomes, left, and Bob Tomes use a rope at Bob Tomes Ford in McKinney, Texas, to reinforce the 10-foot rule. "Whether you're on the parts counter or the service drive," Bob Tomes says, "we want our customers to be acknowledged and to be recognized." At Bob Tomes Ford and Brandon Tomes Subaru, workers must greet any customers within 10 feet of them and ask about their experience. They are empowered to fix problems, even by spending dealership money. Texas dealer Bob Tomes wants his 175 employees, whether porter, sales rep or cashier, to be an extra set of eyes looking out for customers. So at Bob Tomes Ford and Brandon Tomes Subaru in McKinney, Texas, all workers must comply with the 10-foot rule: If they are within 10 feet of customers, they must greet them and ask them about their experience and whether they can help them. If a customer shares a problem, workers are empowered to try to fix it. Some even have the discretion to spend dealership money, without management approval, to address the issue. The practice, in force for about 12 years, has improved customer satisfaction and loyalty, Tomes said. "Sometimes things go wrong, but we sure try to address it and amend it and make it better for them going forward," Tomes said. "Retention of those customers is very important to us as dealers. It's absolutely germane and critical to ongoing growth and profitable operation." Tomes drives home the practice with a simple rope. He keeps 10-foot lengths of rope -- thick, blue-and-white twisted cotton -- in several departments at the dealerships. Managers pull them out often during employee meetings to reinforce the Tomes 10-foot rule and show employees what the distance looks like. "Whether you're on the parts counter or the service drive, we want our customers to be acknowledged and to be recognized," Tomes said. "It's relationship building, relationship selling, relationship, relationship, relationship." Tomes traces the origins of the program to seeing customers visit the Ford dealership and remain unattended for a considerable period. He's also been inspired by the examples of customer service at luxury retailer Nordstrom and fast-food restaurant chain Chick-fil-A. Since the policy was enacted, customer satisfaction scores have gone up. They're above the group average for both Ford and Subaru, Tomes said, and they continue to grow. Tomes bought the Ford store 32 years ago when McKinney, 30 miles north of Dallas, was just a small town. Now it's grown to a population of more than 150,000 and has been named one of the country's fastest-growing cities by the U.S. Census Bureau. The Ford dealership sells about 2,300 new and 1,800 used vehicles a year. 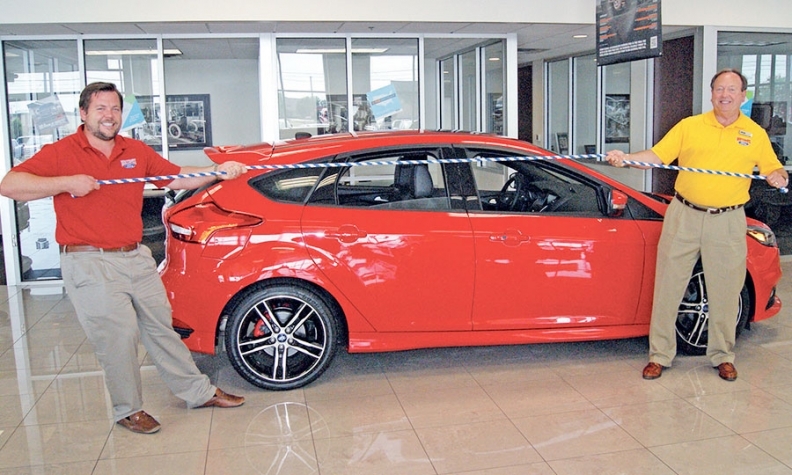 Tomes Auto Group has owned the Subaru store for five years. It sells about 1,050 new and 350 used vehicles a year. The 10-foot policy is particularly useful in the service department, where customers pull in knowing they have a problem and that it will probably cost them some money. A little bit of Texas hospitality helps, said Tomes, who started in the auto industry working for Ford Motor Co. after coming back from service in Vietnam. But it's more than just offering a smile and prompt attention. Service advisers are empowered to spend up to $75 without checking with a manager to solve a customer problem. That could cover free future oil changes, a nitrogen tire fill or a very inexpensive repair not covered by warranty. If it would cost more than $75 to address the issue, the adviser can get the service manager or shop foreman involved to approve something more costly. An example of that could be a safety-related repair that is necessary even if the customer doesn't have the money. The dealership might offer to cover the labor expense if the customer buys the parts. That part of the program has evolved. When Tomes granted that spending discretion to employees a couple of years ago, he gave service advisers a $200 limit. Other rank-and-file employees such as cashiers had a $50 limit, but now they have to seek management approval. All employees had to fill out a customer action report to explain the problem and their decision to spend the money. But Tomes and the other managers learned that involving a second person in the conversation with the customer can get to the root of the problem better and make sure the money is being spent on the right thing. There were times when employees spent the money when it wasn't necessary to solve a customer's issue. Still, he makes sure his employees know the option to offer help is there should they need it. After all, Tomes' whole approach is about relationship building. Said Tomes: "If a customer is not standing in front of us, he's standing in front of one of our competitors down the road."